Fresh, clean and drinkable non-frozen water at all times. A dog house that protects the animal against wind, snow and cold. Dry bedding or resting board inside the dog house. A flap/door on the dog house or a dog house that is constructed to prevent wind from blowing on the animal. Please note if a flap is installed the dog must be able/trained to use the house with the flap. The entrances of dog houses be oriented away from prevailing winds. Dog houses to be elevated off the ground (at least 2 inches above any accumulated precipitation). Abundant dry bedding inside the dog house. A heated or insulated water bowl (please read/follow instructions carefully to avoid fires). 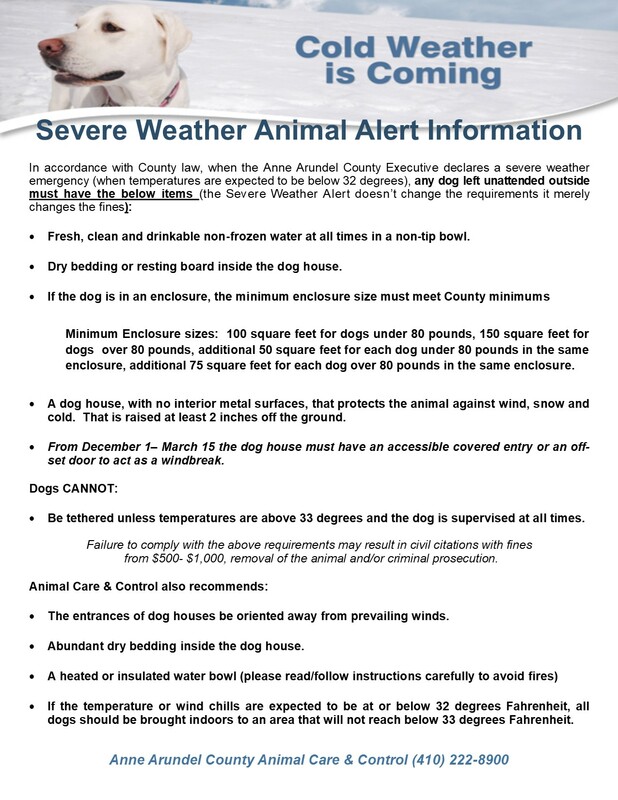 If the temperature or wind chills are expected to be at or below 20 degrees Fahrenheit, all dogs should be brought indoors to an area that will not reach below 33 degrees Fahrenheit. Failure to comply with the above requirements and recommendations may result in civil citations with fines from $125 - $1,000 in violation of the County Code, removal of the animal and/or criminal prosecution for abuse or neglect of an animal in violation of State Law.